The theme for the Museums+Tech 2016 conference was ‘Sharing Our Stories’, but opening keynote speaker Sebastian Deterding, for me, really redefined the day as being about an exploration of curiosity (as well as offering the stand-out quote of the day: ‘information fudge-dump’). 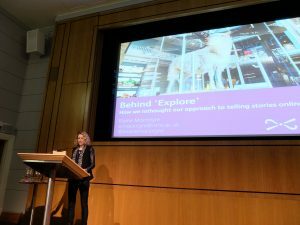 The conference was kicked off by MCG Chair Mia Ridge, who reflected on the friendliness and openness of the sector, which is embodied by all the willing information and experience sharing in the MCG JISCmail. Tom Scott from the Wellcome Trust presented the idea that we challenge our long-held notions of what a library is, and broaden it to ‘a place to discover, create and share ideas so that people can make meaning from knowledge’. Keynote speaker Sebastian Deterding challenged listeners to consider the ‘curiosity gap’ when designing exhibitions or online content for museums. Looking at the example of the news website Upworthy, Sebastian explained how organisations could trigger either curiosity or fear by varying the level of unpredictability, relevance, solvability and safety in their content. Examples of work that gave the audience an enjoyable level of participation were quoted; Quest to Learn: Developing the School for Digital Kids and The Health Museum’s ‘Facing Mars’ exhibition, which presented the attendees with the same question on both entry and exit; would you go to Mars? Sebastian challenged us to ‘candy-wrap’ our content, allowing people to be curious as to what’s inside, rather than ‘fudge-dumping’ all the information out at once. The slides from Sebastian’s keynote can be found here: http://j.mp/musetech. The 11:45 Digital Storytelling (all female!) panel gave inspiring and honest accounts of their experiences in this area. Elaine McIntyre from National Museums Scotland explained how the organisation went from putting all of their web focus on the ‘Visit Us’ page, to investing in their ‘Explore’ online collections database. By conducting audience research and collection feedback, researching other platforms (e.g. BBC iWonder), the team could ensure the usability of the platform. Analytics now show that Explore visitors look at more pages on the website and stay on the site longer. Rhiannon Loosely presented the Museum of London’s Fire! Fire! exhibition bespoke website. This project included a children’s game, a Minecraft experience and a collections explorer; this in turn replaced an old schools/educational website that the museum had on the Great Fire of London. Rhiannon presented the challenges that the project team faced due to funding timescales, the necessity of strategic planning, and most importantly, the ability to let go of the notion that a deadline means everything must be perfect by this date. Rosie Clarke of Culture24 presented the work of the Museums at Night programme, and the streamlining of their activities (‘they’ being, rather shockingly, only two staff members running the whole Museums at Night programme!) They wanted to ensure that they were directing their email marketing only to those who wanted it. To achieve this, they performed data cleanses and email list mergers, as well as asking existing mailing list members to opt in or out of interest topics and clarify if they were heritage sector workers or members of the public. The results? Mailing lists became smaller, but they generated more engagement. Rosie also detailed Museums at Night’s experiments with crowdfunding and website live chat, which have been successful but thrown up new questions. For those of us lucky enough (or maybe keen enough, as it was during lunch) to have had a tour of the Internet Archive, an interesting insight into the workings of the mass-digitisation of archives was offered. The Wellcome Collection was a fantastic venue for the event and those that didn’t take the Internet Archive tour might have used the lunch break to visit the Collection’s new ‘Bedlam: the asylum and beyond’ exhibition (on display until 15 January 2017). Owing to demand, there were two parallel sessions running at 15:15; Session 3a: Working in a Digital World and 3b: Working with Collections. As I work in a collection not yet open to the public, I attended the latter to gather inspiration on innovative ways of using our collection (influenced in no small part by a feeling of affinity with Lucy Moore’s ‘difficult’ collection). Speakers and notes from their talks are below. Kate Noble, Sarah-Jane Harknett, Naomi Chapman, The University of Cambridge Museums, ‘It’s got to be easy to use’: collections based narratives in the classroom and how teachers use digital resources. The University of Cambridge Museums team outlined their consultation work with teachers and their discovery that many educators rely heavily on internet-sourced resources, use of a lot of audio and SMART boards (primary)/iPads (secondary). Teachers who took part in their research stated that they used Google to find supplementary content and generally only looked at the first page of results, or used TWINKL (teaching resources). Teachers want high quality images and videos that they can link in to lessons; but not hosted on YouTube, as many schools cannot access this. Lucy Moore, Leeds Museums and Galleries, Creating an online interactive using a ‘difficult’ collection. Lucy presented how Leeds had utilised their collection of First World War medals to create interactives for all ages, including a create-your-own medal platform that had users from around the world. An Explorer platform for schools, created in consultation with teachers, was also produced. Robert Cawston, National Museums Scotland, Generating engagement: creating playful experiences with museum collections. ‘Gen’ may be the cutest computer animated germ ever seen (or perhaps the only one?) National Museums Scotland used £40,000 Wellcome Trust funding to work with Aardman to create an interactive game using the museum’s biomedical collections; the Gen ‘blob’ gets continually sick and must be treated using digitised objects (like a site-specific Tamagotchi). Find out more and play Gen here: http://www.nms.ac.uk/explore/games/gen/. 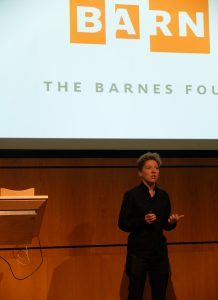 Rounding off the conference was the excellent Shelley Bernstein, Chief Experience Officer of The Barnes Foundation, Philadelphia, presenting ‘How to change the tyres on a moving truck’. Shelley detailed the expansion of her role from Director of Digital Initiatives to include Chief Experience Officer, and how she used behavioural observation to inform her early decisions in this new role. Faced with unique challenges of a new building that looks fantastic but confuses visitors, Shelley presented the interventions that took place in order to align the architect’s vision with the visitor’s expectation. Shelley also detailed the Barnes’ research into revitalising their audio tour (there are no interpretation panels on display, and no photos allowed), and their experiments with wearable tech (the day of the conference, Shelley published this piece on Medium about this journey). By observing visitors, they noticed that the people who came to the Barnes talk a lot in the exhibition space. Not only this, but with their traditional ‘headset’ audio tour, the further in to the galleries they went, the more likely visitors were to remove the headphones and start discussing the works. Moreover, visitors who didn’t use the audio tour were staying in the galleries longer (on average). Combining the restrictions of the space with this research, Barnes’ are looking at implementing a wearable solution in the form of a watch (instead of the more common multimedia audio guide presented on a handheld device). What Shelley highlighted in her work at both the Barnes Foundation and previous role at Brooklyn Museum was the absolute importance of designing for your user’s needs, and with your site in mind. Watch how visitors move through it, listen to the questions they ask. Find out more about MCG’s Museums+Tech 2016 speakers.